Following on from the success of last year’s Active Colour Training day (ACT1), Color Confidence, will be running the next two instalments of the series in the coming months. ACT2 will be in Manchester on 25 September and ACT3 will be in Birmingham on 19 November 2014. ACT is aimed at anyone with an interest in colour workflow. It is designed to teach you all you need to know about managing your colour settings and also gives you the opportunity to meet some of the leading manufacturers in colour management, photography, proofing, image editing and printing. This year’s events will feature 8 exhibitors, a keynote speech from Richard Curtis from Adobe, special offers and discounts on the day, and a chance to win a FREE all expenses paid photo week in Iceland! Exhibitors on the day include X-Rite, NEC, DxO, EIZO, Macphun Software, Epson, TECCO and Manfrotto. 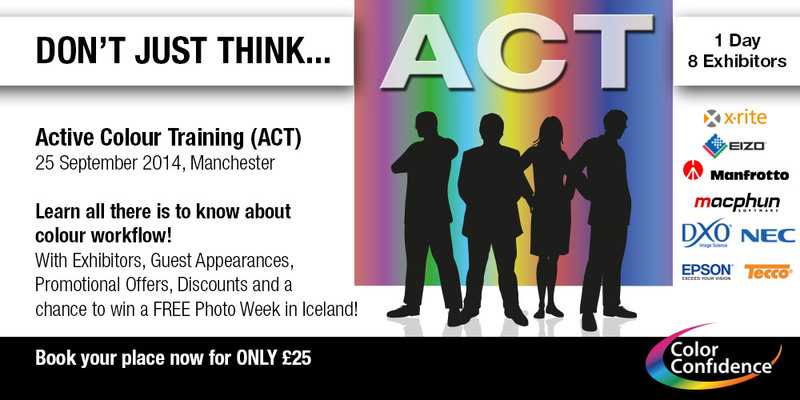 Fine Art & Commercial Photographer and X-Rite Coloratti Mark Wood will be at ACT2 in Manchester to teach you his approach to imaging making. Fashion and Beauty photographer Andy Kruczek will be at ACT3 in Birmingham to offer advice and tips on how to develop your technique as a professional photographer. The training days will take place from 9.30am to 4.30pm. Key topics will include managing your colour workflow, key imaging software and the importance of finding the right monitor. There will also be a Q&A and time for further discussion. Registration for either event is only £25 incl. VAT, which is refundable on purchase of a product on the day. The price also includes lunch and refreshments. Places are allocated on a first come first serve basis so register your interest now! This entry was posted in Uncategorized on August 15, 2014 by Color Confidence.